So I’m waiting to post all my pictures till I get my new computer, but I couldn’t resist putting up one of me with some of those adorable penguins. This is from Fortuna Bay, South Georgia Islands, Antarctica, as a part of my prize from the Nature Valley Granola Bar contest. Now, these are King Penguins, noble creatures while they stand, stoic, in their groups. And when they walk, they are the ones that look like old, British men. 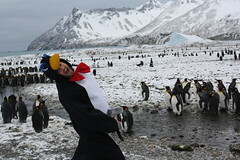 This is to contrast them with my favorite penguins, the Gentoo, which are more graceful when they stand. And when they walk, look like toddlers looking for a lost contact lens. This is (as you might expect) for an upcoming contest entry – I’m not saying which one, but it’s for a LOT of cash, so I hope going to the ends of the earth really helps me out in it. James Cook wouldn’t be the first person I’d want to emulate on being a discoverer (what with the stabbed by the natives and all), but hey, he discovered my country, so I guess I’ve got to give him some props. Yay for you + penguins, looks like fun! win contests and make me actually want to vote for you.